This is Demetre Valaris, I was born in 1955 and I live in Athens, the city under the Acropolis, located in Greece, the country of the gods and civilization. For a good part of the year I am in my 2nd QTH in Gateshead UK. I have been professionally involved in the Maintenance and Communications of Information Technology since 1991, I studied it for the first time in 1974 using a telex machine as a remote terminal and also punch cards. Since 12 September 2018 I was granted an English licence under the callsign, M0SUY which I use whenever I am in the UK. This WEB site is dedicated to Amateur Radio! My favourite Hobby is Amateur Radio, "THE GREATEST OF ALL SCIENTIFIC HOBBIES", and I love using computers with it. This combination is perfect. I can do both my hobbies (amateur radio and computing) together. Amateur Radio without Computers, in my opinion, cannot exist because nearly all Radio Amateur modes need a computer to operate effectively. Even SSB/CW operators use a computer today, at least to log their QSOS (contacts) or to check the DX-clusters! I particularly enjoy operating SSTV (Slow Scan TV), RTTY (Radio Teleprinter) and other HF DIGITAL DATA MODES (PACTOR, AMTOR, PACKET, ROBUST PACKET, etc. ), but I also love taking my radios with me on the mountains in order to operate while I walk. First licensed in 1983 (out of love for SSTV really), having been an SWL (ShortWave Listener's callsign SW1AAU) around 1967. My elmer in Amateur Radio was Dinos Psilogiannis - SV1DB, President of The National Radio Amateurs Union of Greece (alas now closed down). I still enjoy listening to Shortwave AM broadcasters, but not very often now because decent Shortwave broadcasts are getting more and more rare to find as the years go by. I built my first Cat's Whisker (Crystal Detector) in 1967, using a PBS crystal stone as an AM detector, a Cat's Whisker made from the thin [E] string of my guitar, a variable coil using the wire of an old bell with a safety pin and part of a wooden broomstick, a paper capacitor using strips of paper and aluminium foil from a packet of cigarettes and a pair of old army surplus headphones from the flea market in Athens. I was 12 years old then. My first homemade Medium Waves AM transmitter (for EXPERIMENTAL purposes) was built soon after this. I used an 6F6 tube as a VFO and an 6L6 tube as a final. This happened after having burned a 2 transistor mini transmitter because my soldering iron was 100 Watts. Valves do not get burnt by a 100 watts soldering iron!!! Later I used other tubes as finals, such as 807s, 6146s, 811s and 813s. All this happened on and off between 1968 and 1975. When I started as a licensed Radio Amateur operator (callsign SV1UY) I had to construct a homemade 5 watt QRP SSB/CW transmitter and my YAESU FRG-7700 receiver which I had kept since I was an SWL. Soon after this, I built a small Linear Amplifier with an 811 valve. Later I built my own RTTY, SSTV, PACTOR, AMTOR and PACKET Radio systems because when someone is young he is usually short of cash! Construction and operation of SSTV, DIGITAL MODES and HF Portable QRP, rather than country and award hunting were and still are my main interests in Amateur Radio. Other hobbies of mine are PHOTOGRAPHY, ASTRONOMY, MOUNTAINEERING and CYCLING! My ancestors had developed an amazing digital communication system (ancient APRS?). They used fire signals during the night and smoke or audio signals during the day to send messages from city to city or from remote places back to their homeland, much earlier than 1200 B.C. For this reason they had built a whole (DIGITAL?) network of manned telecommunications towers(DIGIPEATERS?) (called Fryktories) on the mountain tops of the Greek islands in the Aegean Sea and on many mountain tops of the Greek Mainland. SOme historians say that in the Trojan war, 1200 B.C., they used this system to notify their cities back home that they had won the war. They used this communication system in a similar way we use our APRS NETWORK with DIGIPEATERS today. Our National Telecommunications Company (OTE) has installed many microwave links to link the remote cities, right next to where our ancestors had built their own telecommunications towers. They were extremely clever people. The word "TELE" the first part of telecommunications, is a Greek word and it means "FAR AWAY". At first they used simple fire signals in order to exchange messages and later they thought of the hydraulic telegraph made by Aeneas in order to exchange more sophisticated messages. Still they could only exchange a few set messages, more than the first system could, but nevertheless a definite number of messages. They could only send as many messages as the hydraulic telegraph could take on it, and they had to be prearranged beforehand. Later they thought of the optical telegraph where they separated the Greek alphabet in 5 groups of letters and each group had 5 letters except for the last one that had only 4 (the Greek alphabet has only 24 letters). This way they could exchange any kind of message they wanted because with this system they could actually send letters and not prearranged messages. This system is the true ancestor of the MORSE CODE that we still use today. In the optical telegraph they used twin telecommunications towers at each end with 5 torches on each side of the station. The torches on the left side were used to indicate which group of letters they where about to send and the torches on the right to indicate which actual letter of the group they were sending. So if they wanted to send the letter "I" they lit 2 torches on the left tower (letter "I" was in the 2nd group) and 4 torches on the right towers (the letter "I" was the 4th letter of the 2nd group). They also used double pipes, just like binoculars without lenses, through which they could see only one side of the remote tower through each pipe, i.e. through the left pipe they could see the one tower of the remote station and through the right pipe the second tower of the same remote station. As you can understand the bigger the separation between the 2 towers of each optical telegraph station, the longer the communication range would be. This range was usually 20 - 30 kilometres but sometimes about 100 kilometres because the nights in Greece are usually very clear. Maximum speed was about 6 letters per minute!!! When they wanted to send encrypted messages they just changed the letter groups and or the number of the groups. Of course both ends should know which combinations they were using. For further information on the telecommunications in Ancient Greece click here! To discover the Technology of Ancient Greeks click here! These systems have been used for over 2500 years until the implementation of radio by Marconi. The Byzantine Empire (a Greek empire) 330-1453 A.D., based in Constantinople, (alas Istanbul today) advanced these systems considerably and if it wasn't for the turkish hordes from the east that occupied Greece for nearly 400 years in 1453, destroying a big part of our civilisation while stopping abruptly all communication activities, communications would have been much more advanced today!!! * The information on the "Telecommunications in Ancient Greece" is based in the work of Christos D. Lazos, a very good Greek historian. Christos D. Lazos has written a great book, in Greek Language, under the title "Telecommunications of the Ancient Greeks". This book is in Greek and is worth reading. I have always been fond of operating with portable radios. I feel that portable operation and QRP are made for each other. Furthermore even today I enjoy constructing radios and most of all QRP radios. I am a member of G-QRP CLUB and Athens QRP Net. I went on the air for the first time as a licensed Radio Amateur in 1983 using QRP Homebrew equipment. This was a 5 Watts, 1.8-30 MHZ SSB transmitter using the VFO of my Yaesu FRG-7700 radio receiver for transmitter frequency generation and the receiver itself for reception. Alas I have not kept the homemade QRP transmitter and FRG-7700 receiver. Later I built a 2 element Cubical QUAD and I worked all the continents with CW, SSB, RTTY and SSTV. Unfortunatelly I took my QUAD antenna down since I moved QTH. Numerous QRP rigs have also been built by myself and one of these is the DSB-80 a kit and the SEVERN TRANSCEIVER from SPRAT of the G-QRP club. Infact I made a dual band (40/20) DSB/CW SEVERN QRP transceiver, a mix of these two nice designs. I built this in 1987 and had a lot of nice 2 way QRP QSOS with it especially when I was on my holidays in the Greek Islands of the Aegean Sea and also for my early portable operations before 1990. Follow this link to have a look at it. No one was calling this kind of operation Pedestrian Mobile /PM then, which I think is not a succesful term since most non English Radio Amateurs do not understand the word Pedestrian. A term such as Walking Portable is easily understood by all. Anyway I was just signing as SV1UY/P, i.e. SV1UY Portable then and everybody knew what I meant. You can follow this link to see an older picture of myself using my trusted MIZUHO MX-14S near the top of Mt. Ymittos. You can also see the 4 meter white cable which was used as a counterpoise. Since November 2000 I am the proud owner of a YAESU FT-817 (a great HF+6m+2m+70cm battery operated 5 Watts little transceiver) with an MP-1 all band manual screwdriver antenna and an ATX 80-6 mini telescopic antenna, I take it everywhere. This radio has taken my signals several times as far as USA, Australia, New Zealand, and of course all over Europe. You can follow this link to see me and my daughter Sophie operating pedestrian mobile with the FT-817 and ATX antenna on the lower part of Mt. Ymittos near our home in Athens. In 2001 I got another nice radio for my backpacking adventures. It is the RACAL PRM4031, a 0.5-30 MHZ, 10 watts manpack ex-military radio of the British Army, with it's own 2.5 meter whip and built in manual ATU. This one weighs around 8.5 Kgr, backpack, antenna, radials, extra battery, cw key and speaker mike included. You can click on the following links to see me operating as a pedestrian mobile station on Mt. Ymittos and on the island of Aegina. Up to now it has taken my signals as far as ZL-land (New Zealand) and VK-land (Australia), and of course all over Europe. I have also done a lot of NVIS (Near Vertical Incidence Skywave) QSOS with it on 40 meters by bending the whip antenna towards the ground. This is the best propagation mode for having HF QSOs within Greece. Bending the antenna towards the ground and connecting a 3 meter or longer radial at the ground terminal of the radio, makes the radiation angle of the radio signals higher towards the sky, hence allowing stronger signals to be transmitted towards the sky and therefore shortening the skip. which is highly desirable for QSOs over shorter distances, i.e. within the boundaries of a country. I have now given my RACAL to my friend Keith G4MSF who is a collector of military radio equipment. For all these vertical portable antennas I use with my portable radios, whether they are the ATX or MP-1 or any other vertical whip, I need some sort of radial/counterpoise, to play the role of the vertical dipole's missing half. Vertical antennas are really assymetric vertical dipoles, so the missing half is important for their efficient operation. Here is a Radial/Counterpoise constructional article with full details and pictures that Dale-W8ABZ sent me and asked me to include it here so that others may benefit from it. This kit is made from 6 pieces of speaker or any multicore 1.5 mm square insulated wire, each wire having a small socket at both ends similar to banana sockets and plugs. By connecting together 2 or more pieces at a time, you have the counterpoise you need for each amateur band. Using various combinations of these 6 pieces one could cover all Amateur bands between 80 and 6 meters, including most of the International Shortwave Broadcaster Bands. The good idea about this article is that one does not need to carry 9 pieces of wire and also we only need 2 pieces at maximum for each Amateur Band, except 80m where we use all six wires, and this is making a robust counterpoise system with one or two pieces being used per band from 40-6 m.
I built 3 of these kits on 15 May 2001 and tested them in all bands. Sorry folks I forgot to test 80 meters but it should work. My ATX, using my FT-817, tuned straight away even on 15 meters where I have always had problems getting a low SWR. I also used it with my MP-1 and FT-817 by laying the radial on one of the rocks of the breakwater in Vayia-Aegina on Sunday 20 May 2001, when I had a QSO with Max ZL1BK/PM from Auckland. I even used it with the 8 foot whip and built in ATU that my RACAL PRM-4031 has as a standard accessory, when I had a QSO with Jim VK2GJM in Sydney. On 28 February 2001 at 06.25z I contacted ZL1BK/PM on 14,348 KHZ via the LONG PATH using CW while I was trekking on the slopes of Mt. Ymittos and I also spoke to him at 06.45z on 14,280 KHZ using SSB. We were both operating as Pedestrian Mobiles (/PM) with very short antennas and only 5 watts so these QSOs have been recognized as a WORLD RECORD since we covered about 22533 kilometers (22593 by other calculations) via the LONG PATH. This has been published by many leading Ham Radio Magazines World Wide (QST, RadCom, SPRAT, Radio Telecommunications Magazine, SVNEWS, etc.) and also by HFpack which only recognised this distance as 17,467 kms - which is the SHORTPATH distance of our 22,533 kms LONGPATH QSOs - but since they had set the rules before our QSOs I can't complain. Nevertheless, noone has ever managed to break even the 17467 kms record up to now. We used the well known propagation technique called CHORDAL-HOP. Follow the next link to see the QSL CARDS we exchanged for the 2 World Record Breaking QSOS. These were my first RECORD BREAKING HF 2 way Portable to Portable QSOs with very short antennas and QRP power. I also contacted Max ZL1BK/PM on 25 February 2001, 4 March 2001 and 11 March 2001 in other bands by using the same rig and antenna. He was also using an FT-817 at 5 watts and a short handheld vertical antenna very similar to mine. On 8 April 2001 at 06.05z I contacted again Max ZL1BK/PM on 21.437 KHZ while I was walking on Mt. Ymittos and then we QSYed down to 18,157 KHZ where we had a 30 minute long SSB QSO with 5-8 reports at both ends. We both used homemade dipoles and the well known CHORDAL-HOP mode over the LONG PATH. We spanned again a distance of 22,533 kilometers over the LONGPATH. I exploited the sloping ground of the mountain with my horizontal dipole facing New Zealand over the LONG PATH with radiation angles lower than 10 degrees while Max ZL1BK was right next to the seawater in the north island of New Zealand using his dipole in a SLOPER configuration and using the sea water as a super reflector to enchance his low angles of radiation. I must mention that my half sized portable dipole was made and sent to me all the way from Northern California from my good friend Budd W3FF, now famous for his walking portable antenna The Buddipole. I have contacted Max ZL1BK several times after 8 April 2001. *** On 6 May 2001 at 05.52z I contacted W3FF/PM while using his dipole and also had QSOs with ZL1BK/M and others. On 10 June 2001 I spoke to ZL1BK/PM from Ymittos while I was trekking up there with G4MSF who had come to visit me in Athens. He also had a contact with ZL1BK/PM thus equalling my World Record. On 1 July 2001 at 04.55z I contacted again ZL1BK/PM on 14,345 KHZ using SSB while I was trekking on Mt. Pilion. W3FF/PM was on frequency too. I was using my RACAL PRM4031 with its 2.5 meter whip without any radials and I had the radio in its backpack case and over my shoulders. Again we used propagation mode called CHORDAL-HOP. Signals were 5-1 but the frequency was so clear that we had a 40 minute QSO. Budd W3FF/PM could not hear me very well though. Click here to see a picture of myself in QSO with ZL1BK/PM, W3FF/PM on Mt. Pilion. Until the end of 2002 we used to meet nearly every Sunday morning at 05.00z on 14,342.5 KHZ, at 05.30z on 18,157 KHZ and sometimes at 06.00z on 21,437 KHZ. After 06.00z I used to stay on 21,437 KHZ or 28,337 KHZ till about 08.15z while I was walking on Mt. Ymittos and I usually talked with my good friends G4MSF, G0EHX, SV1VN, ZL1BK, W3FF and many others from the USA, VK, JAPAN, EUROPE and I was even heard as far as FIJI by Raffy VK2RF operating as 3D2RS with his FT-817 and ATX (a 1.6 meter tuned whip) antenna. Many americans were curious to see if we were really telling the truth so they were always there eavesdropping (hi hi hi) every single Sunday morning. They were dying to break our World Record, but as far as I know noone has ever managed to break it up to now. At 08.15z I used to QSY to 7,088 KHZ to talk to the Greek Emergency Net. Of course nowadays with propagation changes I do not get up that early any more but I still try to monitor 14.340 KHZ and 7.088 KHZ, the EPRG calling frequencies many Sundays from 09.00 GMT until late and also some week days. I also monitor 145.425 KHZ/88.5 HZ CTCSS when I am at home, usually every evening. When I walk to the mountain I usually take my Kenwood TH-D7 to send APRS Beacons every 5 minutes to show my exact location. You can follow my trek by clicking here. You can send an APRS SMS to SV1UY-7 to arrange a sked if you wish. I also use APRS as an alert mechanism when I am on the mountain, to alert my friends that I am QRV for an HF Portable QSO. If you are interested in portable HF radio I would love to hear from you in order to have a 2 way HF portable QSO. You can just call me on 7.088 KHZ, 14.340 KHZ on SSB/CW or e-mail me for a sked if you wish. If you are near Athens call me on 145.425 KHZ/88.5 HZ CTCSS which I monitor every night after 22.00 local time or whenever I am in the shack. I also monitor RU5 Mt. Parnitha Repeater/ECHOLINK 255006 when I drive and operate APRS sending APRS Beacons nearly every 2 minutes with my TM-D700 when I am in my car, so you can click here to see where I have just been driving. You can also send an APRS SMS to SV1UY-9 when I am in my car. In November 2001, Keith G4MSF and I formed a discussion group at YAHOO called European Portable Radio Group. This is an interesting discussion Group for all aspects of Portable Radio and tries to bring together all the European Radio Amateurs that are interested in Portable HF/VHF/UHF operating so that we can exchange ideas via this Group. Use this Group as a meeting place to post skeds and reports, info about equipment, antenna design and questions - anything at all to do with Portable Radio. All kinds of modes that can be used while portable (CW, SSB, HF DIGITAL MODES, PACKET RADIO, APRS, SSTV, ATV, etc.) and any frequencies (HF/VHF/UHF) are accepted as being on topic here. Although we do encourage QRP power levels when portable, because QRP and portable radio operating are usually made for each other, this does not mean that we are fanatic about it!!! We encourage anyone interested in portable radio operation to join the group. It does not cost anything and you have no obligations at all. We also keep your e-mail address as safe as possible by not making it public. This Yahoo Group is absolutely SPAM free, due to our anti-SPAM policies. RTTY (Radioteletype) is a telecommunications system consisting originally of two or more electromechanical teleprinters in different locations connected by radio rather than a wired link. Landline teleprinter operations began in 1849 in USA.The system was designed by Emile Baudot in 1874 and used a five unit code. RTTY is also called Baudot. Radioteletype evolved from these earlier landline teleprinter operations and it was used in all mobile units of the armies, in aeroplanes, boats etc. From the 1980s the mechanical teleprinters were gradually replaced by computers running teleprinter emulation software and today you can easily find a free RTTY program for your windows PC and using your Soundcard as a modem you can operate RTTY for next to nothing. Such a program is MMTTY by Makoto Mori - JH3HHT and I believe that MMTTY is a good software only solution for RTTY provided you use a good Soundcard Interface such as my microHAM USB Interface III or similar. I still use MMTTY today because it can work in pseudo-FSK RTTY MODE with my FT1000MP. This is as good as true-FSK RTTY and superior compared to AFSK RTTY because the TONES are generated inside the FT1000MP and they are pure sinewaves not squarewaves as in AFSK so I do not have to bother with ALC settings when I operate RTTY with MMTTY and I can operate my FT1000MP at maximum power for 3 minutes continuously if necessary. I can also increase or decrease power without having to check the ALC each time the power output changes. This is very convenient!. There is also another nice Multimode HF Digital Modes program which supports RTTY as well as all the other modes. This can run in Windows, LINUX and OSX O/Ses and it's called Fldigi. Author is W1HKJ. It also offers pseudoFSK but it is complicated to set up, so I still prefer MMTTY instead. Both these programs are FREEWARE. When I first got involved in RTTY I used a heavy Surplus Teleprinter Machine from the American Army for a few months, but this was too noisy, oily and needed constant maintainance, plus paper. I replaced this setup with a Homemade Terminal Unit with a Square Matrix of 81 red leds CROSS TUNING INDICATOR connected to it for easy RTTY tuning, using the Sinclair ZX81 Home Computer with RITTY, an RTTY program from G4IDE in an EPROM. I built this system in 1984 and had many happy QSOs with it (I must remember to take some pictures to show you since I still have this gear). Later I used a Sinclair ZX Spectrum Home Computer with the same Terminal Unit but using RITTY-9, the latest RTTY program of it's time from G4IDE. After 1995 I made a new Terminal Unit designed by G3LIV and BMKMULTY, a program written by G4BMK for DOS computers, which supported RTTY, CW, AMTOR and PACTOR. I run this setup in an OLIVETTI QUADERNO, an A5 size DOS mini Laptop with a V30 [email protected] and a 20MB Hard Disk. Slow-scan Television (SSTV) is a picture transmission method used mainly by amateur radio operators, to transmit and receive static pictures via radio in monochrome or colour. A technical term for SSTV is narrowband television. Broadcast television requires 6 MHZ wide channels, because it transmits 25 or 30 pictures frames per second, but analogue SSTV usually only takes up to a maximum of 1.5 KHZ of bandwidth. It is a much slower method of still picture transmission, usually taking from about 8 seconds to 2 minutes, depending on the mode used, to transmit one image frame. Since SSTV systems operate on voice frequencies, amateurs use it on shortwaves (which is also called HF), VHF and UHF radio. It was invented in 1957-58 by Copthorne Mcdonald WA2BCW (now VY2CM). In 1958 he wrote a paper about it and in 1968 the mode was officially recognised by FCC. He developed the 1st 120 line SSTV system using an electrostatic monitor and a vidicon tube. SSTV was use to transmit pictures from many SPACE missions back to earth by the Americans and the Russians. Commercial systems started appearing in USA in 1970 and required sophisticated equipment which was very expensive. These were used by few Radio Amateurs who could afford them and by the police the army etc. These services still use them today in many parts of the world. In the early 1990s many systems that used PCs, special SSTV software and cheap ISA cards as the SSTV modem, appeared in the scene and more amateurs got involved. The only expensive part was a VIDEO Camera needed to transmit live pictures. Today all computers have SoundCards and there are many free SSTV programs available, MMSSTV is one of them, so it has become a very popular mode because anyone can work SSTV without any cost practically. Really all you need today is a decent SoundCard since the computer SSTV programs use it as an SSTV Modem, a decent WEBcam and you are on the air. Unfortunately free Analogue SSTV programs leave a lot to be desired and for me the best SSTV program that shows the smoothest and clearest Analogue SSTV pictures is CHROMAPIX at a cost of 120 $. In the end you get what you pay for really! SSTV was the main reason why I became a licensed radio amateur, after having being introduced to it by Dinos SV1DB in ELECTRON 73 Radio and Electronics exhibition in Athens. This happened in 1973. After getting my Amateur Radio license in 1983, I used for many years a homemade 128 line RAM Converter with 3 memories, which I built from a design of G3WCY/G4ENA for the members of BATC (British Amateur Television Club). This unit has 80 TTL and CMOS chips and supported the LINE SEQUENTIAL 24 secs COLOUR TX/RX MODE as well as the 8 secs BW mode. I used a PHILIPS CCTV BW Camera to capture the pictures and my Sinclair ZX Spectrum Personal Computer with a homemade SSTV Interface as a Text Generator SSTV MACHINE by G1FTU for typing my CQ calls etc. I built this converter in 1985-86 and and I still have it today. In 1996 I discovered a nice DOS SSTV program called GSH-PC by Geza DL4SAW. This program worked perfectly all the new 256 line Colour SSTV Modes, such as Martin 1 etc, by using an ISA SSTV Card and Camera capture device built in the same card. So this was the 1st hardware SSTV solution built in a PC card. Today I use ChromaPIX for SoundCard Analogue SSTV (best SSTV program ever due to it's special DSP decoding techniques that shows the smoothest and clearest SSTV pictures, not pixelized ones like all free SSTV profgrams do) and my SCS PTC-II with JVComm32 again for Analogue SSTV, although CHROMAPIX is superior. For DIGITAL SSTV I use my P4dragon or PTC-II modem and DJ0CU's latest terminal program for SCS Pactor modemsSimple32Gold which support DIGITAL SSTV QSOs between 2 stations connected in PACTOR 3 or 4 ARQ mode allowing me to use my WebCAM or other loaded files to be sent ERROR FREE. This system works like ANALOGUE SSTV in the picture presentation because your correspondent at the other end of the QSO can actually see your transmitted DIGITAL SSTV picture presented on his computer screen 3 lines at a time as it is being decoded and fast/perfect picture delivery is guaranteed because of PACTOR 3 or 4 transport protocols. This ability of the above setup using PACTOR 3 or 4 with a PTC-II or P4dragon modem as a means to transfer the picture make Simple32Gold the only DIGITAL SSTV systems that DESERVE TO BE CALLED SSTV because most other programs are really glorified FILE TRANSFER programs, not real SSTV! Simple32Gold also supports a BROADCAST DIGITAL SSTV MODE. This can be viewed simultaneously by many people who also use Simple32Gold and a PTC-II series modem in PACTOR 3 or P4dragon modem in Pactor 4 ARQ mode. I sometimes operate this sort of DIGITAL SSTV on 14,109 KHZ Center Frequency (14,107.50 KHZ DIAL) with others who are QRV on PACTOR 3 or 4. If you care for a sked please e-mail me. Finally when I am out and about operating portable I use a Visual Communicator VC-H1 Portable SSTV Camera with my TH-D7 or FT-817. This SSTV Camera supports most Analogue SSTV Modes and also DIGITAL SSTV via 9600 bps PACKET RADIO MODE, using some protocol similar to UDP. Click on My Live SSTV RX to see what is my FT-1000MP receiving right now. Check the time that the top picture has been received in order to understand if my SSTV Receiving Station is online. You can watch what other Radio Amateurs are seeing right now at World SSTV Cams. Here is a very nice SSTV Presentation by KA8VIT and KC8OWL. Another nice SSTV page with a nice demo of the 1st SSTV images in 1960 by W3WVG is here. You can find a lot of information and links about SSTV in CQ SSTV de KB4YZ WEB site. And last but not least, here is OE1RIB's mobile SSTV System based on a PIC controller which is very good for the mobile operator, and another nice mobile SSTV page by WA8LMF using the Kenwood VC-H1 portable SSTV. There is also SSTV Pad for your Iphone. Here is a picture of my shack. You are invited to come in for a virtual visit. Today I use an FT-1000MP at home with a 5.5m EX-CB Vertical on the roof with an SGC-230 ATU. I have worked more than 100 countries ages ago without even trying (mostly with QRP), but I do not count them anymore because I am not at all interested in collecting DX awards. I love the technical part of amateur radio and of course SSTV, PACTOR and PACKET Radio rather than award hunting. Do not get me wrong, I like DX and occasionally I will have a QSO with a DX station, but I am not interested in awards. I work DX mostly when I walk on the mountains and operate HF portable! ANTENNA, HF MOBILE, SSTV, PACKET RADIO, HF DIGITAL MODES, (PACTOR 1/2/3 & 4), AMTOR, PSK31, RTTY, Radio Wave Propagation Prediction and of course TCP/IP over RADIO. For my HF/VHF/UHF mobile operating I first used a GCR-1000 (a Greek made 25 watt output HF radio), later a Yaesu FT-100 and now a Yaesu FT-857D with an ATAS-100, a Diamond HF mobile antenna or a SIRIO monobander 80 meter HF mobile. I have also used an (80-10 meter) PRO-AM HF mobile, but it is too big. I would like to get a hold on an original Screwdriver HF antenna some day. I also use the Kenwood TMD-700 for APRS and Voice Communications when I drive and if you like to track me while I am driving or to see where I've been, you can click here to see my SV1UY-8 car or here to see my SV1UY-9 car. When I drive around Athens I am always QRV on RU1 which is also connected to ECHOLINK Node 255006, so if you have ECHOLINK access you are welcome to connect to this node and call me for a short QSO. PACTOR is a radio modulation mode used by amateur radio operators to send and receive digital information via radio. A robust network of PACTOR stations has been established to relay data between amateur radio stations and the Internet, extending Internet access for the radio amateur on the go. PACTOR utilizes an almost ideal combination of simple FSK modulation, and the ARQ protocol for robust error detection and data throughput. General improvements to PACTOR include PACTOR II, PACTOR III and since May 2011 PACTOR IV, which are capable of higher speed transmission. Net throughput of PACTOR (now called PACTOR I) is 153 bps, PACTOR II is 1200 bps, PACTOR III is 5200 bps and PACTOR IV is 10500 bps all with internal ONLINE compression. PACTOR II and PACTOR III can still work with SNRs as low as -18 dBs in a 4000 Hz radio channel whereus the latest one, PACTOR IV, can work with SNRs lower than -20dBs in a 4000 Hz radio channel (-22dBs in a 2.4KHZ SSB Amateur radio channel). Of course speed gets gradually slower at such low SNRs but you don't loose your link even if the tones are inaudible to the human ear. Who can still claim that nothing can beat CW? No one because PACTOR II, III and IV are the most ROBUST ARQ MODES available today! Pactor (Latin: The mediator) was developed by Special Communications Systems GmbH (SCS) and released to the public in 1991. It was developed in order to improve the reception of digital data when the received signal was weak or noisy. PACTOR is an evolution of both AMTOR and packet radio; its name is a combination of these two technologies. PACTOR combines the bandwidth efficiency of packet radio with the error-correction (CRC) and automatic repeat request (ARQ) of AMTOR. It also employs Memory ARQ and online DATA COMPRESSION to increase throughput. Amateur radio operators were instrumental in developing and implementing these digital modes. PACTOR is most commonly used on frequencies between 1 MHz and 30 MHz. PACTOR is an established standard for FSK/PSK radio teletype on shortwave amateur and marine radio today. Newer versions are used by amateur radio operators to transfer large binary data files and to accomplish Internet E-mail access over shortwave radio. Winlink 2000 is a global communications system which uses PACTOR as well as other technologies (PACKET RADIO, WINMOR, APRS), but PACTOR 2,3 and 4 are their primary and fastest modes. I also love the idea of HF PACTOR<===>VHF/UHF AX25 GATEWAYS which I think brings radio hams closer to each other and after all what is ham radio all about? It is certainly about interactive communications and international friendship, through a decent QSO, without barriers. DXing, contests and 5-9 reports are OK for some, but not for me. So I hope to have my own HF PACTOR GATEWAY ready on 40/30/20m some time in the near future, time and other obligations permitting of course (no I have not abandoned this idea yet). I often connect to (ON0BEL who is going to operate again very soon),IK0MIL, GB7CIP or UA6ADV on 14,110.40 KHZ Center Frequency with Pactor 3 in order to read PACKET MAIL or use the Gateway to browse through their Local AX25 VHF/UHF Packet Radio Network. Do not forget that PACKET Radio, PACTOR and generally HF DIGITAL DATA COMMUNICATIONS are not only MAIL or BULLETING FORWARDING as many PBBS sysops, or NETROM BARONS and PACKET KINGS have you believe. There are plenty of other applications out there, such as FILE TRANSFER, APRS, QSOing, CONVERSing with many radio hams simultaneously, DX-CLUSTER, discussions over MAILING LISTS, visiting remote amateur networks, playing games, e-mail and many other TCP/IP and numerous plain AX25 applications. I have been using an SCS PTC-II controller since August 1999 with SCS's own terminal program PLUSTERM under DOS. Now I use DJ0CU's Simple32Gold, best terminal program, specially designed for SCS controllers. I find PTC-II to be the best HF/VHF DIGITAL MODES CONTROLLER, after having used a Homemade Terminal Unit designed by G3LIV using BMKMULTY software written by G4BMK, a KAM and a KAM PLUS TNC from Kantronics for many years. This SCS PTC-II controller allows you to operate RTTY, CW, AMTOR, PACTOR 1/2 & 3, PSK31, 300/1k2/2k4/9k6 BPS PACKET RADIO, 600 BPS ROBUST PACKET RADIO, WEFAX, NAVTEX, Analogue SSTV and DIGITAL SSTV via PACTOR 3 using DJ0CU's Simple32Gold sophisticated terminal program in a very efficient way and without slowing your QUAD Core Windows PC down to a halt. It only needs a slow PC to operate all supported DATA MODES, SSTV and DIGITAL SSTV. Since January 2012 I am the happy owner of a P4dragon DR-7800, the latest and greatest Pactor modem from SCS. This is a fantastic modem supporting Pactor 4 as well all the older legacy Pactor modes, Pactor 1-3, Packet Radio (1200-9600bps) and can also monitor RTTY and NAVTEX signals on it's OLED front panel DISPLAY without the need of a PC. So I can now operate Pactor 4 on HF at the lightning speed (for HF) of 10500 bps and I use it for Pactor QSOS, ROBUST PACKET, Pactor 4 DIGITAL SSTV, Pactor 4 file transfers, WINLINK2000 MAIL, RTTY Monitoring, as a Waterfall to see how HF signals look like and other uses. It is the FASTEST and most ROBUST HF DIGITAL MODEM that exists today in Amateur Radio! For more information about this modem go to P4dragon's Website. There is yet another new PACKET RADIO Mode called Robust Packet Radio (RPR in short). This is indeed what it says (Robust) and it works on HF having 8 x MSK carriers that fit very nicely in a 500Hz passband (perfect for our 500Hz XTAL/Mechanical Filters) unlike conventional AX25 HF Packet which needs at least 800 Hz and it is very lossy on HF. The good thing about Robust Packet Radio is it's ability to correct a corrupt packet (due to it's 8 carrier design) at the receiver end and this makes it ideal for HF APRS applications because propagation flucuations and QRM/QRM/QSB resulting in received corrupt packets are very common on HF. This can be helpful not only in APRS which works in unconnected mode, but on Linked Radio connections as well. Another good thing is that it has a frequency tolerance of +/-240Hz so you can even receive correctly an off frequnecy, mistuned Robust Packet Radio signal. This is ideal for unmanned stations such as IGATES, DIGIS, BBSes etc. There is an APRS Network that operates in Europe and has spread to North America and South Africa too, called Robust-Packet-Network, which operates on 30 and 20m and also uses correctly setup IGATES that allow you to use RPR (Robust Packet Radio) in order to communicate with the global APRS Network on HF/VHF/UHF/APRS-IS etc. It works very well indeed. Most activity is on 30m but there are also some stations on 40m and 20m. You can be in one subnet and easily contact someone else who is QRV in another subnet in another HF Frequency with the use of the IGATES. Everyone uses WIDE1-1 as a maximum APRS PATH and this works FB. For more information see: Robust-Packet-Network Website. If you like to read more info on how RPR works, download RPN's MANUAL (RPN=Robust Packet Network) in the middle of the left frame in the above site. Read pages 15-18 for a detailed description of Robust Packet Radio. The new WINLINK Trimode RMSes are now QRV on PACTOR/WINMOR/RPR (RPR=Robust Packet Radio) simultaneously and this means that you can also use your RPR Modem for WINLINK radio e-mail as well as for APRS, QSOS and other uses. Robust Packet is available in all SCS Modems except, the old PTC-IIe due to it's small and not ugradable RAM. Also PTC-II modems that have not goa the upgraded RAM plu the DSP-II+ modem do not support RPR either! The newest P4dragon series modems support RPR since February 2015 provided they have firmware 2.10 or higher. The cheapest and smallest Robust Packet Modem is the SCS Tracker/DSP TNC and this little beast is very cheap compared to the rest of SCS's modems. It is a small wonder. Apart from supporting RPR it is also an APRS Tracker, and does all speeds of AX25 Packet Radio from 300-19200bps. On 300bps it is very tolerant as it can tune signals +/-400Hz (i.e. terribly mistuned HF Packet signals) and on 9600bps it can use plain FM radios from the earphone output, no need to connect it to the descriminator of your radio. So apart from ROBUST RACKET RADIO it does much better AX25 PACKET RADIO than any other PACKET RADIO MODEM available especially on 300baud and 9600baud, although the UZ7HO Soundmodem does a better job on 300 baud AFSK PACKET than any TNC and slightly better than the SCS Tracker on PACKET because it uses MEM ARQ from PACTOR! For more information go to the SCS Website and click on products. Of course there are many exotic new HF Digital Modes and you can also operate these modes with your computer's SoundCard without a special modem but don't forget that you really need an expensive SoundCard and even then you must adjust it (and keep adjusting it regularly) against WWV for satisfactory operation, otherwise you are wasting your time because you are depended on the very unstable clock of your soundcard. Also Windows keep changing the soundcard you have assigned to your DIGITAL MODE program as they please and you have to forever keep changing it back to the proper SoundCard! Even the best soundcards have a 100ppm drift, therefore even if you adjust it against WWV it will still drift like hell, as the computer gets hotter and as you start running more and ore programs at the same time that you run your DIGITAL MODE program. This is probably OK for Asynchronous modes such as PSK31, RTTY, Analogue SSTV and some other exotic digital modes but not at all good for ARQ modes, even the new interleaved ARQ modes. So SoundCard Warriors beware!!! One of the best Multimode Soundcard Programs is Fldigi which is FREEWARE and maintained by W1HKJ. It has most, if not all, HF DIGITAL MODES and this guy keeps improving his program almost weekly. Another very good Multimode HF DIGITAL MODES program is MULTIPSK which I call "The Swiss Knife of all MODES (DIGITAL and ANALOGUE)". This program is written and maintained by Patrick F6CTE and is supported very well. It is FREE, but not for all modes, and apart from all exotic HF DIGITAL MODES it also supports SSTV, ALE, FELD HELL, SITOR, GMDSS, ACARS, DGPS, HFDL, COQUELET, HFFAX, etc just to name a few and it has a very clever and effective way of calibrating you SoundCard. As for the price it is about 30 EUR if I remember correctly and if you pay more features in the professional modes are activated. All the Radio Amateur modes can be operated for FREE. The program has a different user interface without pull down menus, it looks like a big BOX with all the buttons in the front panel and I like it very much. It is worth trying. These days I hang around 14.107,5 (DIAL QRG) Mark/Space 1600/1400 HZ, which is 14.109 KHZ (CENTER QRG) QRV for PACTOR 1/2/3 and 4 QSOs (with my latest P4dragon DR-7800 Pactor Modem from SCS), so if you are QRV on PACTOR 1/2/3 or 4, please give me a call. In January 2008, Jack VK4JRC and I formed a discussion Yahoogroup called pactor_packet. This is an interesting discussion Group for all aspects of Pactor and Packet Radio and tries to bring together all Radio Amateurs who love Pactor, Packet and other associated ARQ modes and actively use any of these modes for their QSOS etc. You can use this Group as a meeting place to post skeds and reports, info about equipment, and questions - anything at all to do with Pactor, Packet Radio and associated ARQ Data Modes. We encourage anyone interested in Pactor, Amtor, Packet Radio, Robust Packet Radio, APRS etc to join the group. It does not cost anything to join and you have no obligations at all. We also keep your e-mail address as safe as possible by not making it public. This Yahoo Group is absolutely SPAM free, due to our anti-SPAM policies. I use Radio e-mail quite often via the Winlink 2000 system (WL2K in short). This system was started by a group of American Radio Amateurs for the Radio Amateurs on the go and for Emergency Communications. Many Radio Amateurs have installed numerous HF/VHF/UHF Nodes all over the World that are also connected to Internet so there are more than 100 HF Trimode RMS PACTOR/WINMOR/RPR Access Points with frequency scanning, 230 VHF/UHF RMS AX5 PACKET Access Points, only for Radio Amateurs. APRSlink uses hundreds VHF APRS IGATES in every part of the World. This system can be used by Radio Amateur operators globally for sending/receiving e-mail, download Weather Maps, Weather Reports and other useful information. From home or when portable by utilising PACTOR 2, 3 or 4 on HF with my P4dragon, SCS PTC-II or SCS PTC-IIe modems or by utilising RPR with my SCS PTC-II or SCS Tracker/DSP TNC and my ASUS eeePC701 or 901 netbooks using Airmail 2000 version 3.5.025 by Jim Corenman KE6RK. Pactor 2 has a net throughput of 700 bps (1200 bps with compression) with 4 speedlevels using a bandwidth of only 500 Hz. Pactor 3 has a net throughput of 3600 bps (5200 bps with compression) with 6 speedlevels using a bandwidth of 2200 Hz. Pactor 4 has a net throughput of 5500 bps (10500 bps with compression) with 10 speedlevels using a bandwidth of 2400 Hz. Robust Packet has a speed of 300 or 600 bps but as SCS says it can be pushed up to 1200 bps and more, although we have not seeing any firmware for speeds higher than 600 bps yet. It uses 8 x MSK carriers and only needs a 500 Hz wide channel. I can also use APRSlink with my VX-8E or TH-D7E on APRS when I operate walking Portable and all I have in my pocket is my VX-8E or TH-D7E. Also by using VHF/UHF PACKET Radio with my TH-D7E and ASUS eeePC701 or 901 with Airmail2000 software v 3.5.025 by Jim Corenman KE6RK, AGWPE by SV2AGW and AMPE by KG9OG. Finally I could do "the same" but with a SLOWER and a lot LESS ROBUST HF Digital Mode called WINMOR (soon to become ARDOP) (a soundcard HF ARQ Digital Mode) using my QUAD Core Windows 7 Desktop PC. HF WINMOR is supposed to be as fast as Pactor 2 by design, but it can get close to Pactor 2 only when HF conditions are perfect, but it is not as robust as Pactor 2 when there is QRM/QRN/QSB/multipath distortion etc. Of course it doesn't go anywhere near Pactor 3 which was the original goal of it's author, never mind Pactor 4. WINMOR can't work efficiently with a cheap netbook such as an ASUS eeePC701 or 901, because Netbooks don't have enough computing power. I have noticed that WINMOR, just like any protocol that uses a soundcard instead of a hardware modem, has too many issues with O/S latency, that is why they do not use synchronous ARQ mode, so I'm not so sure if it is any good for Portable Operations or for EMCOMM use! It is cheaper though and if you can't afford an SCS PTC-IIe (which costs as much as a cheap HF Radio) or the newest SCS P4dragon (net throughput with compression is 10500 bps) in order to use HF Pactor, then it can be a good solution for your Radio E-mail needs provided you have a fast PC (more expensive than a slow PC that a Pactor modem needs) with less latency issues, such as a Desktop PC. You also need a Good, thus expensive 2nd SoundCard, or a Signalink SLUSB interface, plus the cost of WINMOR, which is $39 in order to get rid of WINMOR's NAG Screen. If you do not have a new high power PC with a good SoundCard, you need to spend $600 - $1000 for a QUAD Core, about $120 for a Signalink Interface and $39 for WINMOR. You should also be prepared to make, and keep making tedious SoundCard adjustments, CONTINUOUSLY, in order to keep WINMOR working in an acceptable order! Windows is notorious for altering the SoundCard Levels, anytime it feels like it and they keep changing they way they treat Soundcards from one version to the next. It is never the same! These are WINDOWS inherent faults and these make most SoundCard Modes unattractive to me except perhaps for RTTY, SSTV and the UZ7HO Soundmodem which is the best 300 baud PACKET RADIO DECODER, better than any TNC including the SCS Tracker in 300 baud AFSK PACKET mode! So this Winlink 2000 Radio E-mail system is extremely useful especially when I am on my holidays or somewhere without an Internet feed. You can contact me on SV1UY @ WINLINK.ORG (use either capital or small letters) even when I walk on the mountains. I will receive your e-mail in my VX-8E HT via APRSlink. Mobile phones do not work on the mountains but APRS or HF PACTOR do. When I am near a city with an RMS PACKET Node, I can also access this Node via PACKET Radio too, otherwise I use HF PACTOR to access any RMS PACTOR Node via HF. If you send an e-mail to my radio e-mail address just remember to precede the subject line of your message with "//WL2K " and a space after it, without the quotes, for example [Subject: //WL2K (then any normal subject)]. and keep it short. This is Winlink 2000's anti-SPAM mechanism. I can also receive attachments (pictures, text, zip files, etc.) when I have access to HF PACTOR 3 or PACKET Radio. Of course if you are a Winlink 2000 user, you just have to address your message to SV1UY without using the @WINLINK.ORG part after my callsign. The great thing about the Winlink 2000 system is that I can receive my e-mail via radio no matter where I am in the world, and I do not have to inform the system like the WhitePages of the old PACKET MAIL FBBBBS system about which is your nearest BBS. My e-mail is just stored in Winlink 2000's wordlwide servers and I can pick it up using HF PACTOR, HF WINMOR, APRSlink via APRS, VHF/UHF PACKET RADIO, telnet if I have no radio equipment with me and I have internet connection in my netbook, even at an Internet Cafe using Internet Explorer and Winlink's WEBmail facility. I even get a notification in my VX-8 when I switch it on and send an APRS BEACON if there is any radio e-mail waiting for me and I can even read it and send a short reply with my VX-8 or any APRS capable radio. This works in a similar way POP works in your PC with Outlook e-mail program. For more information about Radio e-mail you can visit Winlink 2000 WEB site here and read all the information you need. As a conclusion I must say that the best and most reliable Radio e-mail system is Winlink 2000, others don't even work. All we need is a PACTOR 2,3 or 4 modem or an RPR modem on HF and a cheap-small netbook computer with either Windows or Linux running Airmail or RMS Express. We can also access our WINLINK Radio e-mail via APRSLink by using an APRS HT, such as a TH-D7/D72, a VX-8 or an APRS capable mobile radio, such as a TM-D700/D710 and a Yaesu FTM-350/400. Two of the popular protocols used on HF in the WL2K system are WINMOR and Pactor. While WINMOR may not equal P2 and P3 or P4 in total message transfer performance, it provides a cost-effective means of using the system, and is more robust and faster than P1, and faster than P2 in favorable conditions. WINMOR is attractive to anyone who has trouble justifying the high cost and low utilization of a P3-P4 modem. Mariners, who daily use radio email for long-distance lifeline communications at sea, can usually justify a Pactor modem purchase. EmComm agencies who fund equipment purchases are smart to opt for advanced Pactor modems for reliability and ease of use under the stress of emergency operations. Successful WINMOR operating requires skill in making multiple adjustments, and knowledge of the computer's operating system, which often do not lend themselves to success under the pressure of an emergency situation. I must say that I do not totally agree with Winlink 2000's WEB site. I have tested WINMOR many times and have found out that in real life (i.e. on real HF COMMS) it is not at all faster than Pactor 2, nor is as robust as Pactor 1, never mind Pactor 2, 3 or 4. It is nearly as fast, but always slower than Pactor 2, and Pactor 1 is more robust than WINMOR in all cases. In the LABORATORY, WINMOR seems to be as good as Pactor 2 but this is not the case when it faces bad HF conditions that are common most of the time! Also something they keep well hidden in their comparison is the fact that in it's FAST mode WINMOR needs a 1600 HZ channel when Pactor 2 needs only 450 HZ and if one uses a 500Hz narrow XTAL filter the improvement in SNR makes the difference bigger in favour of Pactor 2. After all the above, I think that although SoundCard Modes are OK for QSOS such as SSTV, RTTY, PSK31, Olivia and other exotic modes where you don't mind repeating your CALLSIGN, NAME and QTH twice, they are not suitable for RELIABLE and FAST Radio E-mail, DATA Transfer over Radio, Networking over Radio or Emergency Comms, a hardware Modem solution such as an HF PACTOR 2/3 or 4 modem, is the most suitable solution. Second best might be WINMOR or the new ARDOP (still under development), although it is not much cheaper overall because you either have to pay an amount for a PTC Modem and keep your old PC, or buy a fast new PC with a decent soundcard and/or a suitable interface (a Timewave NAVIGATOR or a microHAM USB Interface III, even a crappy SignaLink USB are not free), then buy WINMOR (it's not free either) and suffer from PC latency, SoundCard instability (notorious in Windows even if you buy a SIGNALINK interface with a built-in soundcard), slower speeds, HF QRM/QRM/multipath distortion while you are struggling to send your very important e-mail or do your important file transfer, if these are important to you of course. I'm not so sure how much money do you save in the end and if it's worth saving so little at the expense of all above mentioned drawbacks! I like very much operating PORTABLE PACKET RADIO (especially when I travel), and I love using it when I go mountain cycling or mountain walking (well I am still trying hard to cycle regularly, but I do walk often enough with George SV1GGY). 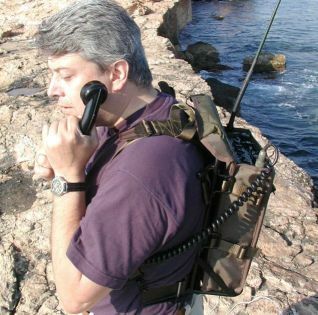 I usually take one or more of my PORTABLE PACKET RADIO setups when I am out and about or when I am on holiday. I have 3 nice KITS for PORTABLE PACKET use. My favourite one is the setup with the HP200LX because it is very small in size, it is a real DOS palmtop computer with 80X25 screen, I can run full size 640 k DOS programs in it, and it can operate for many hours with 2 AA size alkaline cells. For this reason I take it with me almost everywhere. In 2000 I got a Kenwood TH-D7 and I can do PORTABLE PACKET RADIO with it's internal TNC hooked to my HP-200LX and also APRS with my GARMIN-III GPS receiver. Today I use my TH-D7 more often with my Winbook TW-700 and AGW Packet Engine and AGW Terminal, or FLEXNET with Paxon Terminal. You can follow these links below to find more information about my old PORTABLE PACKET KITS. I am a member of ATHnet, which is the Greater ATHENS Metropolitan Area TCP/IP Amateur Radio Network. ATHnet is an informal group of Athenian Radio Amateurs that love internetworking via radio. AMPRnet e-mail, PBBS MAIL, WEB SERVER, WORLD PACKET Radio Connectivity (AX25 and NETROM), WORLD AMPRnet Connectivity, WORLD DX-CLUSTER, WORLD CONVERS SERVER and much more are offered to LICENSED RADIO AMATEURS. Interested to know more about ATHnet? Follow one of these two links below. I am responsible for issuing the AMPRnet IP addresses in Greece. AMPRnet is the AMATEUR PACKET RADIO NETWORK that uses TCP/IP over radio. So if you live in this country and want to get involved in our TCP/IP Amateur Packet Radio Network activities you need an IP address. Here you can find the latest DOMAIN.TXT and see how many Radio Amateurs are involved with TCP/IP over Radio in Greece. You can easily contact me via e-mail on sv1uy @ yahoo.com or via Radio e-mail on SV1UY @ WINLINK.ORG . Please do not phone me. Respect my personal life. Remember this is ONLY A HOBBY for me. *** Type "DXC" to join the DX-CLUSTER and enter your callsign at the login prompt. When you are in the CONVERS SERVER (you may have to ENABLE LOCAL ECHO if you use the WINDOWS TELNET CLIENT or Hyperterm), type /n callsign and you will go to channel 154 to have a QSO with SV Radio Amateurs. Please use your CALLSIGN to logon. You will probably find me there from Monday - Friday after 22.00 Athens time and anytime during the weekend. Download and install TTYlink, a very nice FREEWARE TTYlink and TELNET CLIENT program that has been made by PA3AZK especially for radio amateur Windows (W95, W98, WNT, Win2000, WinME, WinXP and Win7) computers. It has a one line buffer at the bottom of the screen where you can type/edit your lines before you send them to the CONVERS, the DX-CLUSTER or the MailBox/GATEWAY you are connected to. This is very good because it does not mix the incoming with the outgoing lines and you always see what you are typing before sending it. If you are a LINUX user of you use JNOS in DOS, Linux or Windows, then you have no problems with the CONVERS. It is only the Windows TELNET client program that has a terrible terminal emulation which makes things difficult for you. If you have problems using this SERVER please e-mail SV1UY, the administrator of this system.